Exponential growth prediction tool estimates a future value based on past performances. This calculator estimates a future value of something based on past performance. For example, our website's monthly organic organic traffic (the one from search engines) grew from 43236 in July 2016 to 137018 3 months later. I want to find out how long would it took to reach 1 million visitors if the growth rate was maintained at this incredible level (I don't think we can grow that fast for a long time, to be honest). So I entered 137018 in the initial value field in the future group and 1000000 in the (like this, click to fill in the calculator). It told me we'd reach one million in 3.4 months. While it's not always true that things follow the exponential growth pattern, sometimes they do. This calculator is meant to help you peek into the future and either see how much of something you'll have after some thing has passed or the other way around - how much time will it take to reach some goal. Some thing grow linearly. Some don't follow any pattern. 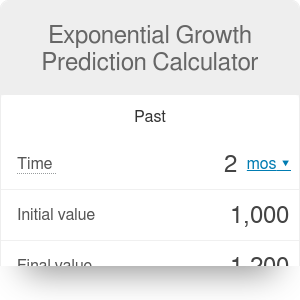 Sometime things stop growing... this calculator assumes exponential growth and won't be any help in those other scenarios. We have built a few other calculators you might find handy: rule of 72 calculator shows how long it takes for some value to double. Website ad revenue and CPC/CPM calculators estimate how much money you might be earning with that increased traffic. Exponential Growth Prediction Calculator can be embedded on your website to enrich the content you wrote and make it easier for your visitors to understand your message.